ALERT! LAX-SIN $872 & 19787MQM – 4.4CPM ~45,000Skymiles for DM! This one is SICK! WoW! Possible to use GU certs as a DM (maybe). Either way, you must overnight in SIN but a day recover could be nice. This is a BOATLOAD of points. HT for the idea from MightyTravels on FT here. Check this out. A DM could earn almost 45,000 Skymiles for this puppy and bring NET cost down to $400 range for almost 20,000 MQMs. Few dates but April 28 May 1st or May 12 – May 15. Wow, this would be an awesome mileage run if it wasn’t during the week. I cant burn a whole work week. I did a LAX–NRT-SIN-NRT-LAX mileage run last year but was able to do it Fri-Mon which only cost me 1 day of work on Friday. It netted me 17,558 MQM. @farcasternet – I am looking as any options. 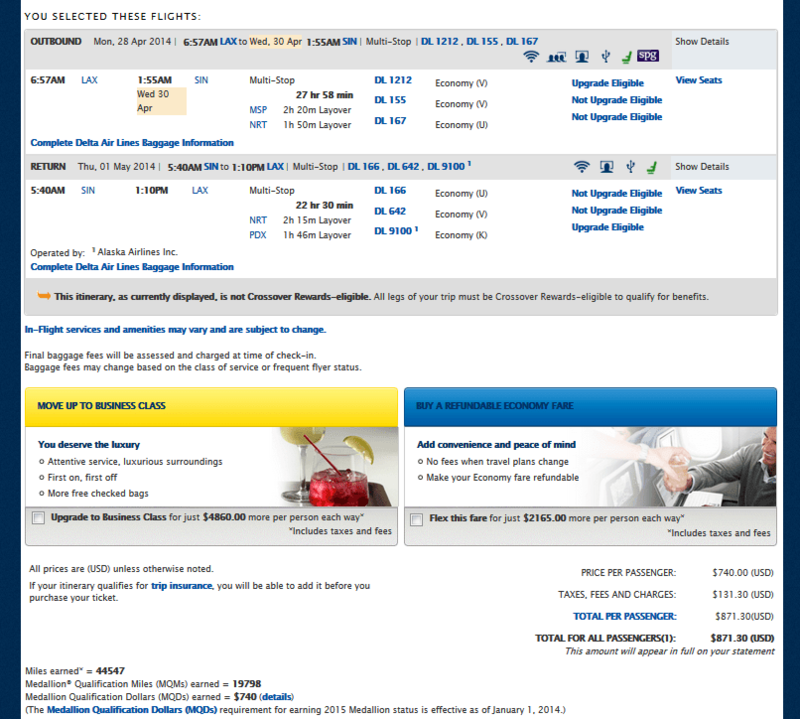 I see for 5.5CPM in AUG 22,000 MQMs and 50,000 SKYmiles. Just sick fun. @rene, 22K MQM, that’s crazy!! What dates did you find that in AUG and was it a weekend run? I’m new to MRs. I have tried searching message boards for this question but no luck. Do you run into any issues with customs/immigration trying to explain why your flying all the way to Singapore for basically 1 night? Do you get “flagged” by TSA for doing these types of runs? @Randy – most places no and if you ever do all you do is tell them what you are doing. You can not get “flagged” for just flying a lot on airplanes 🙂 – it may be different, but not wrong! Dates? Lowest im seeing is 5.4ish..
@David – the AUG dates are at a higher price but you can route to get MORE MQMs and MORE RDMs so still a great price. Thinking! I know I sound “lazy” by asking this, but any help/suggestions to max MQM and minimize CPM for August dates?